Sauté the onion in a little olive oil. Add the steak and spices. Cook till almost done. Add the mushrooms, garlic and paprika. Cook till done. Whisk the soup powder / stock into the milk and cream. Add the milk mixture to the steak. Bring to boiling point. Taste and adjust seasoning. 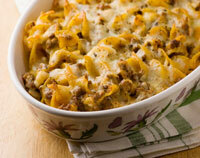 Either serve the sauce over the pasta with cheese sprinkled on top or combine the sauce and pasta in a casserole dish. Top with cheese and bake at 180 degrees celsius for half an hour before serving.